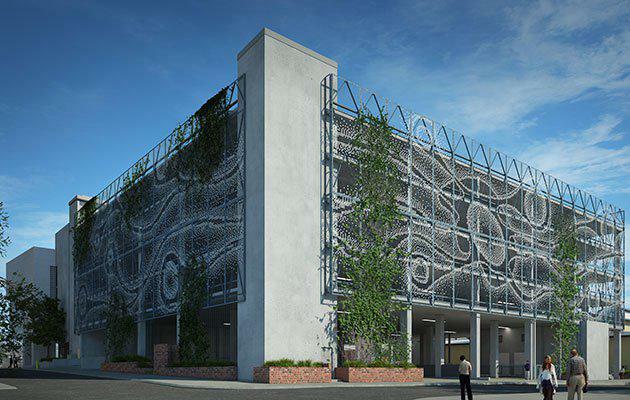 The façade of a new five-storey car park at the Brisbane Showgrounds on King Street is the canvas for an award-winning public art installation. 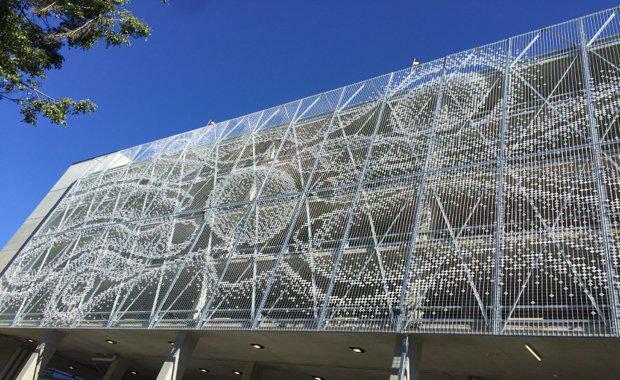 The pixel-like artwork running down the structure's façade was designed Local QUT industrial design student Tom Emmett, and is expected to be the pilot canvas for installation and the first artwork of this nature in Brisbane. Mr Emmett's design was inspired by the "continual flow of people, ideas, producers, livestock and culture through the Brisbane Showgrounds over 100 years". His work was chosen from a competition where he beat four shortlisted entries after an initial judging round. His design used a series of 10cm white diamond-shaped pixels placed at junctions on the mesh façade which faces King Street and Alexandria Street. Brisbane Showgrounds Project Director Andrew Hay said he was extremely proud of the collaborative venture between The Buchan Group, RNA, QUT and Griffith University. “Public art is about community and this project gives those involved a chance to leave a legacy for both Brisbane and the Showgrounds community,” he said. The entire piece required the use of 57,500 white diamond-shaped pixels, which were installed in five days by over 100 volunteers. “The King Street façade started with the idea of a stylised and rustic metal screen that replicates the agricultural language of a farm gate and then using the mesh as ‘canvass’ for some form of art," The Buchan Group Senior Associate Paul Watson said“This simple idea gained traction to create a system in the form of the pixel that could be readily used as the medium for the artwork competition. “Many dedicated hours of development followed by volunteer installation has resulted in a significant Brisbane urban artwork that The Buchan Group is proud to be associated with,” he said. The new 380 bay cark park at the Brisbane Showgrounds will open in time for Ekka. "The Brisbane Showgrounds is one of Brisbane’s most well connected and walkable neighbourhoods, a lively entertainment, retail and events quarter providing an inner-city lifestyle like no other," Hay said.